When it comes to visiting historic houses, it’s rare to find an empty one as interesting as one that’s full of antique treasures. 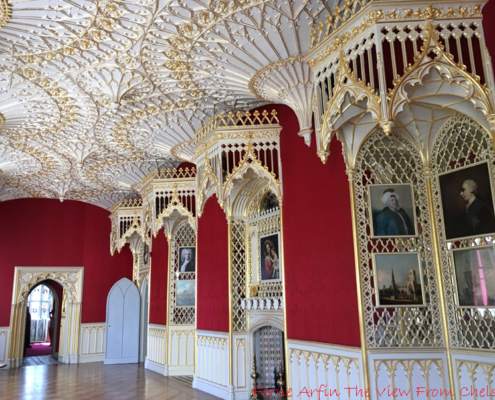 Strawberry Hill in London’s western suburbs is an exception. This mini-castle in Twickenham is a true jewel box of a house – but its collections were sold off in the 19th century and it’s completely empty. It hardly matters. The house is so eccentric it can stand on its own, without the embellishment of furniture and doodads. 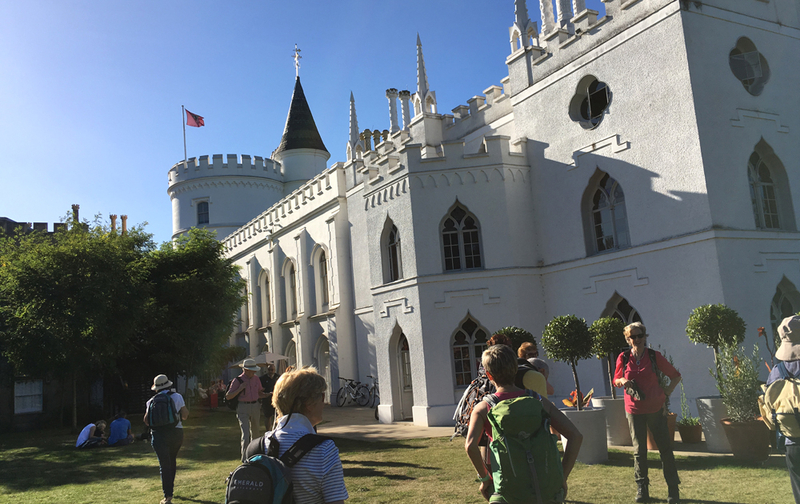 The house was created by Horace Walpole, a flamboyantly camp 18th century dandy, MP (for a Parliamentary constituency he never visited once) collector, world traveler and writer (his novel The Castle of Otranto was the world’s first Gothic novel). Enamoured of Medieval Gothic, he kick started the fashion for neo-Gothic architecture decades before it really took off. His house, built to show off those now vanished collections, was the first in the style and one of the only examples of it in domestic architecture, inside or out. 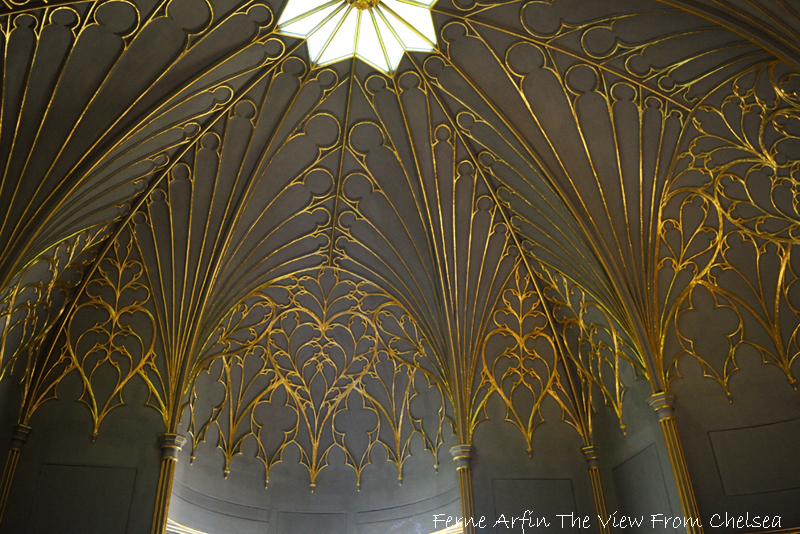 Strawberry Hill’s very emptiness adds to the Gothic romance; when the house is quiet, you can imagine ghostly whispers following you from room to room. On entry, visitors are given a facsimile of the little guidebook that Walpole wrote himself. It contains sketches of what used to exist within this extravaganza of gilt ceilings, gothic windows, stained glass, mirrors and the most amazing fireplaces and chimney pieces. For a sharper view of the images in the gallery below, click on each image separately. 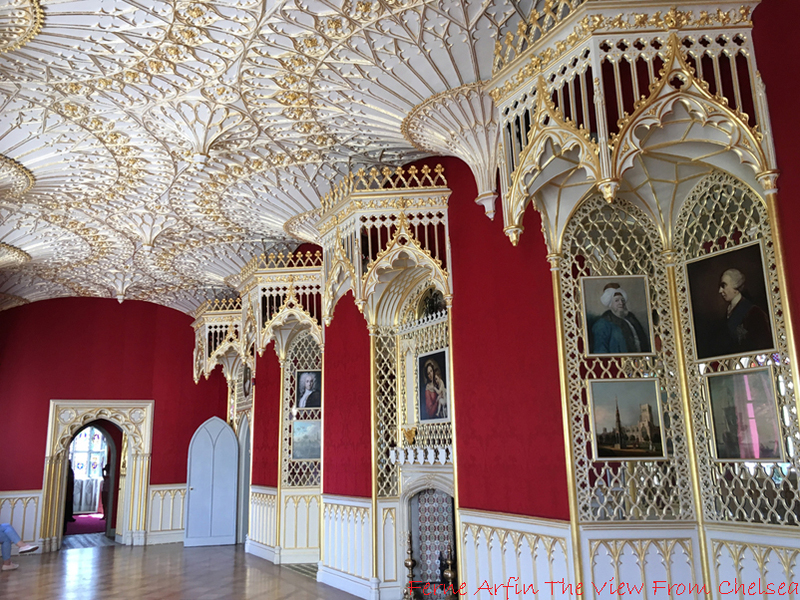 All the rooms at Strawberry Hill have gilt details but the Long Gallery, with it’s elaborate ceiling, has more gold than any other room in the house. 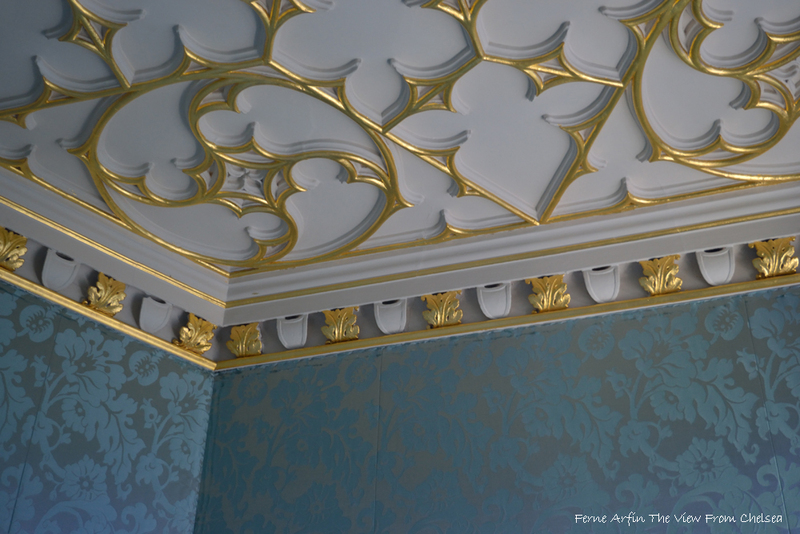 It was inspired by a chapel ceiling at Westminster Abbey..
Walpole’s interest was primarily the Medieval period. 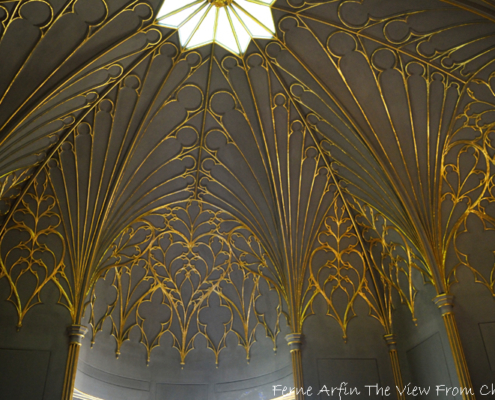 That is why at Strawberry Hill, both interiors and exteriors, were designed in the Gothic Revival style. 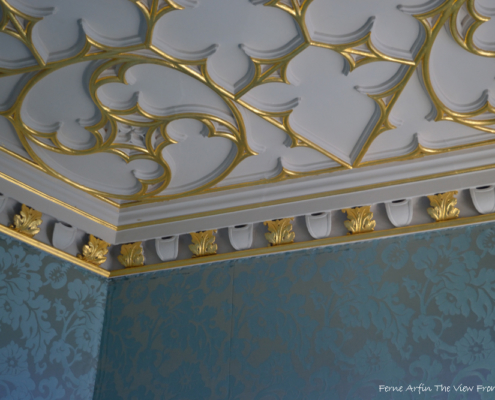 But he also employed the finest contemporary designers, builders, and craftsmen of his day to copy examples of the style he admired but could not actually own. 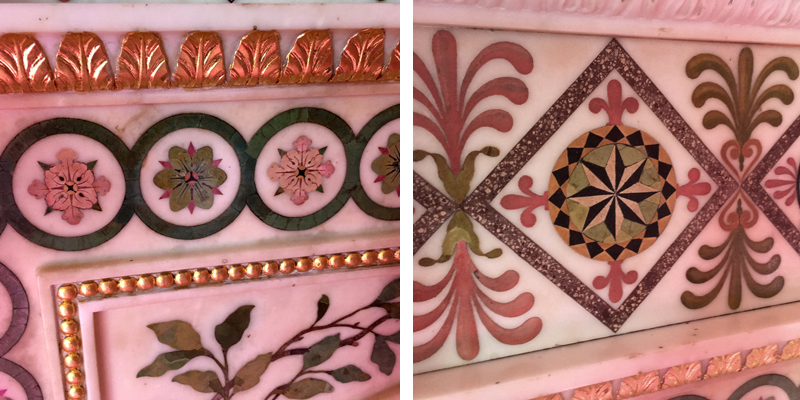 The chimneypiece is decorated with a polished combination of pigment, glue and plaster of Paris known as scagliola. A set of wrought iron gates guarded the entrance to “The Tribune”, a small, square room that was Walpole’s cabomet of curiosities. 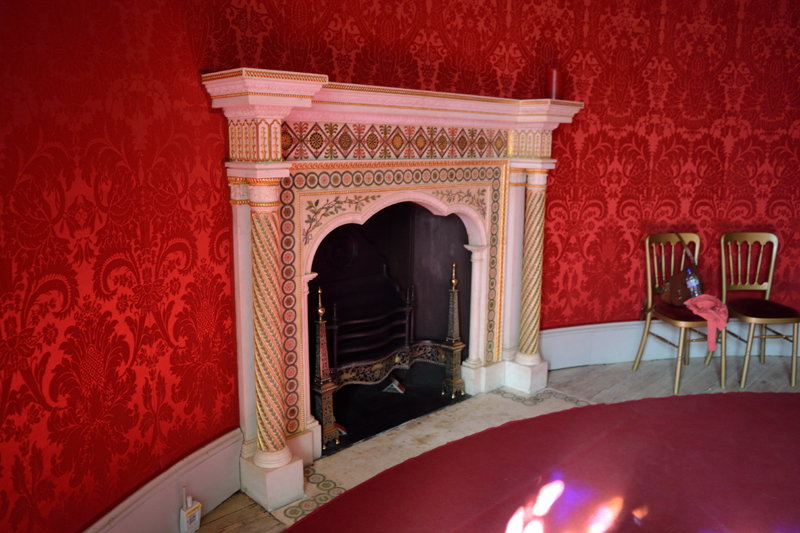 Most visitors gained a glimpse of this room through the closed gates. Only the most important guests were invited inside to examine the treasures close up. That included opening the rosewood cabinet, designed by Walpole himself, which held a priceless collection of miniatures and valuables. Today the cabinet can be seen at the Victoria and Albert Museum (V&A) though, sadly, its contents have been scattered. The collections at the V&A also include miniatures by English and French artists, a remarkable carved “cravat” made by the 17th and early 18th-century woodcarver, Grinling Gibbons (have a look), and an assortment of decorative silver, gilt and enameled objects. The British Museum holds a beautiful crystal scepter mounted with gold, enamel, and pearls. And, if you head for Glasgow, stop at the Burrell Collection, in the center of Pollock Park, to see if you can find the champlevé enamel on a copper casket or “chasse” that is a model of the shrine of Thomas à Becket. How all these beautiful things were scattered to the four winds (literally – there are pieces in museums in America, Australia and all over Europe), came down to a nasty divorce among Walpole’s eventual heirs. Blue Bedchamber, with a copy of Sir Robert Walpole’s bed and a family portrait, made for this room and on loan from the National Gallery. 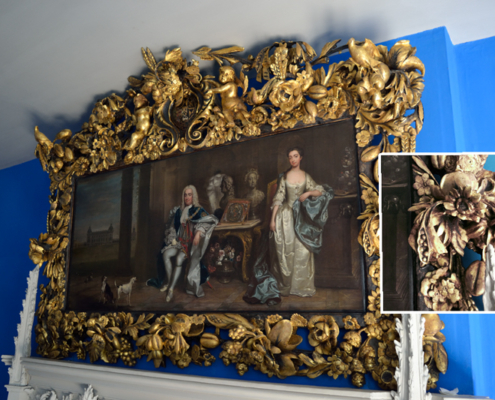 The remarkable gilt frame is a computer printed reproduction. made from more than 30 separate pieces, printed and then assembled. Library, with books arranged within Gothic arches. The Holbein Chamber, named for the collection of Holbein drawings Walpole once kept here.Its massive chimneypiece is modeled after an archbishop’s tomb at Canterbury Cathedral. For a short time only, you can see some of Walpole’s treasures displayed as they have not been seen for more than 170 years. 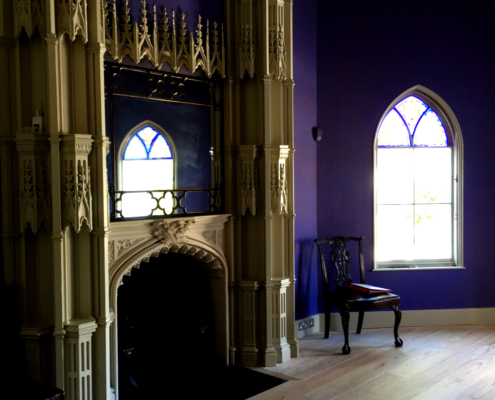 The exhibition The Lost Treasures of Strawberry Hill, is on every day until until February 24, 2019 and unites some of the most important elements of the collection with the rooms and room plans that Walpile created. Directions: Strawberry Hill is at 268 Waldegrave Road, Twickenham, TW1 4ST, about 25 minutes by car from Central London. There’s a small parking area. 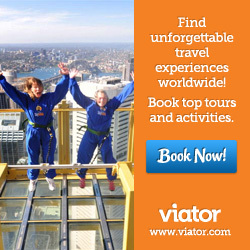 You can also get there easily on public transportation: Take the No. 33 Bus from Hammersmith Broadway Station (District or Piccadilly Lines) to the Strawberry Vale stop, a one minute walk from Strawberry Hill. Or cut about 20 minutes off your trip by taking the Tube to Richmond Station (District Line) and catching the 33 Bus there. Café: The Cloister Coffee House, on the ground level, is open from 10 am to 6 pm. The menu is a cut above the usual tea-cakes-and-boring-sandwiches fare at most heritage attractions. Choices, which occasionally change, include lovely filled flatbreads, soups, salads and more ambitious hot courses as well as stuffed baguettes, very nice cakes, and afternoon teas.